Here in the mountains of NC it is hard to find good hunting land or leases within 30 to 40 minutes of most major cities. Everyone it seems is fighting over increasingly smaller and smaller plots of land, and the bigger plots are dominated by large hunting clubs with high fees or limited "seating". I've been working through this process myself recently trying to acquire some land for my son and I to hunt (he just turned 6), and thought I would share my findings with you. 1.) Make a nice 8x10 (black and white is fine) and ask permission to hang these at feed mills, pawn shops, and gun stores. Farmers frequent feed mills, and farmers like hunters because they keep the critters away from their crops. Pawn shops and gun stores have hunters as well. 2.) Post it on Craigslist. This really isn't even worth doing, if your area is like ours it's a 40 to 1 ratio. 40 hunters looking for land vs. 1 land owner looking to lease. This is worth a try, but don't get your hopes up. 3.) GIS / Mapping research. This one is the golden egg. All counties have GIS / Mapping departments, and these mapping systems have all of the mapping data. It's this we are going to take a closer look at. First step would be to decide your requirements. 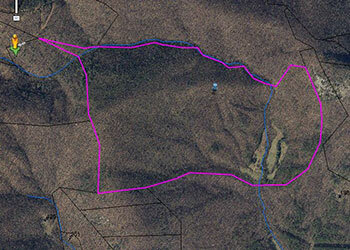 Are you looking for 700 acres for a new hunting club? Are you looking for 30 to 40 just for you and a buddy? Is water a requirement? Hardwoods with nuts? If you could describe the perfect property what would it look like? Once you have figured out what you are looking for Google your County GIS. Find a suitable area and start selecting parcels (plots). Data should appear regarding these properties. This data will include; owner, acreage, address, tax value, location, and a host of other details. Layers are available visual images that can be loaded and they usually include things like; rivers/streams, contour lines (elevation changes), school districts, etc. The most recent aerials will show you locations of any houses or barns. You will want a plot that has no obstructions in most directions. The aerials are all flown in the winter long after all the leaves have fallen, this helps increase ground visibility in images. What this means is that the trees you see are evergreens, not hardwoods. This is important to remember. Don't call the land owners, you will likely just get hung up on. Instead formulate a nice professional letter explaining your interest, be sure to stress that you will be respectful and keep their land in better shape than when you first arrived. Many times owners are willing to lease land for tax money or tax money + some other ammount. Mail the letters and cross your fingers and wait. With any luck you will have some new land to hunt next year. Let us know how it goes, and if this has helped you find a nice spot. Also if you are in Western NC and have some land you are interested in leasing please let us know in the box below.